I am so excited to be a part of this MEGA hop. You are in for a real treat today as you hop along with many designers giving you ideas and inspiration for the new release at Simon Says Stamp. Baby Party Animals as balloons! Shined up their bellies with irRESISTible Pico Shimmer, an awesome Tiny Alphabet Background stamp, itty bitty button embossing folder and a vellum tag. How about a shaker card suited for anyone?!? There is that awesome Tiny Alphabet Background stamp again (love it) inked with Kaleidacolor Tomato Vine, a Stitched Rectangle as the shaker, sentiments and banners from the Baby Party Animals stamp set. Of course no shaker is complete until you fill it with sequins and such. Make sure to comment on each stop along the way as Simon Says Stamp is giving away a MEGA prize package at each stop. If you find a broken link along the way, you can always click here to find the entire hop list. Now go...go see what Amy has in store for you, but leave me some love first for your chance to win! Baby animals bouquet = cute! What a cute idea to turn the baby animals into balloons! Fabulous cards!! Love the animals as balloons and the shaker card is awesome!!! Adorable use of the animals as balloons. Love the balloon bouquet! Cute! Adorable Baby Animals card. Like shaker style as well. I have the Birthday Farm Animals & have made a couple shaker style cards this wk. What fun cards!!! I love the animals turned into balloons! I love the party animals as balloons! Cute cards! The shaker is really unique. Baby animal balloons are adorable. Baby blues.... Jajaja cute idea for a diferent way to use stamps..
Adorable creation, love the cute critters! Wonderful creative designs, Penny! Love the little details you added! Baby Party Animals as balloons...so cute! wow! such great color choices! The party animals balloons are so fun! Two beautiful cards.... LOVE the baby party animal balloons! oh my goodness I love the party animals as balloons card its just adorable. But you are right that shaker card is awesome as well and would suit anyone...especially makes me think of the fall for some reason. Love the animals as balloons. Very creative. Love the card with the blue baby animals. I really love that tiny alphabet stamp!! Great cards! I love your shaker card!! LOL! What a cute idea! Who wouldn't love a bunch of animal balloons! Thanks for the wonderful inspiration! Hee-hee! I'm always up for a shaker card, especially as cute as this one! I love that you made the critters into balloons! That's a super great idea!! Cute cards! Thanks for sharing them. Love the animals. Makes me happy. Balloons with the baby animals, how cute! Loving these new stamps by SSS. How cute! Thank you for sharing. I love what you did with the baby party animals! Loving this release! So much fun! Wow would have never thought to use the animals for balloons.... Great cards, thanks for the inspiration. Oh my...love your cards. I really like how you used animals to make balloons, so clever. This SSS is out of this world. Hi Penny. The blue balloons is a cute idea. I bet it would look really cool in old fashioned sepia too. I loved your shaker card too. Grat how you used the bakes twine for the balloon strings. Animal balloons! What great inspiration! Clever animal balloons! Love it! Such a good idea to make the critters balloons! My kids would love those critter balloons! Fellow Floridian here! The balloon animals are adorable! The party animals balloons are epic. Super love! Great cards! Love those background stamps! Baby card is so so cute. Love all the details on your cards. The shaker design is so unique. Wonderful cards. Love this alphabet stamp. Hahahahaha, Love the party animal balloons :) How clever. Great use of the new product for the shaker card too. One of my favorite card types. Cute card! Love the idea of turning those birthday critters into balloons! Awesome way to use the stamps. So much inspiration. thank you. Love the cards. Interesting use of the baby animals. Great release!! Great cards! Love the party animal cards with the balloons & twine. I'm all about shaker cards so I fell in love with yours! 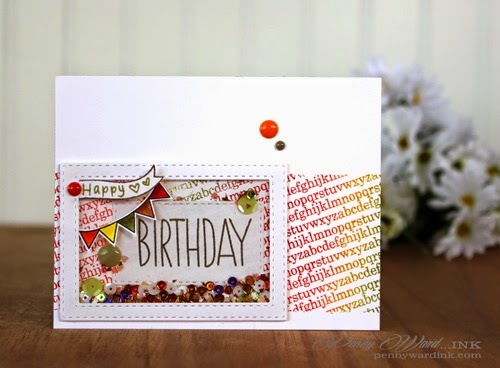 Crazy about the small alphabet background stamp! Will use that often! Beautiful cards! Those animal balloons are too adorable! Both cards are amazing!! Great preview of some awesome new products. Thanks for sharing! How CUTE are those baby animals, huh? Love these! Both cards are original and wonderful. Awesome use of the products. Love the colors and designs. Love the balloon idea with the animals! Really cute cards. Great idea making the animals part of the balloon bouquet! Love the Baby Party Animals as balloons, especially their bellies. Such awesome cards but you had me with those animals balloons they are really the cutest. TFS. I love this baby card using the baby animals. Thanks for sharing. Love your cards. The baby party animal stamps are sooooo cute. Such a clever idea with the unique balloons! Great cards. Love the way you colored them both and the velum tag makes it so special for baby. Nice use of colors for the birthday card. Unisex cards are very versatile. Cute card made! Thanks for the inspiration! These animals balloon bouquet is so much fun! Talking about creativity! Amazing card! Oh, the animal balloons...so clever! The birthday shaker is just brilliant. Your cards are exquisite, love the animal balloons!!! comical party animals in a bunch of balloons. Love. Beautiful x2! The tiny alphabet background is soon going to be my go-to; it can be used for any occasion. Love the critter balloons. Now I have to order the set and try that. Set is very versatile. Very creative, love those little critters on the first card! Fun and cute cards!! Thanks for the ideas! Love the animal balloons. A fun, happy card. The color blending on the second card is so pretty. Darling idea to turn your critters into balloons! The animal balloons are ADORABLE, great cards!!! I really loved both cards! I love your inking. Beautiful & innovative. A cute bouquet of balloons. This stamp set has so many possibilities. Love your cards. Love those cute blue balloons and I'm loving that tiny alphabet. Gorgeously cute and adorable blue baby card - amazing and I love how you made those balloons with real twine!! Awesome!! The second card gets my mind thinking of ways to use that alphabet background - LOVE this cool shaker card - super impressive!! So glad I stopped by today!! Awww! They remind me of Mickey Mouse balloons...Very cute! Love the shaker card, so cool! Turning the baby animals into balloons. My mind is officially blown! Cute cards! Thanks so much for sharing! So clever to turn the animals into balloons! Oh my gosh, love the baby animal balloons! And the shaker card is so cheery. Thanks to Simon for the chance to win. Oh my goodness the critters are so cute holding the balloons. Fabulous card! Loved the animal balloons! Where does your inspiration come from! Great idea to make them balloons! I once did the same thing with Easter eggs, held by a rabbit. Cute cards! Your balloon bouquet is so cute! And I love that alphabet background. It's on my must-have list! Look at those adorable critter balloons! Fab! Lovely cards! Love that Baby Party Animals set! Both cards are fabulous... Especially the birthday card shaker. I so want the mini alpha background stamp! Love the balloon idea! A great use for many different kinds of stamps. Fabulous cards as usual! So love your work!! Both so cute!! Love the animal balloons!! Love how you made the baby animals into balloons. So cute. fun card - love the blue animal balloons! What a fun card, adorable balloons! Lovely cards. Liked you shaker card and the colors. Cute cards! Love the balloon bouquet. What a fun idea to turn the little guys into balloons! Great cards. Thanks. Thank you for sharing your beautiful cards with us. Very nice work. Love the baby animal balloons. Very clever. This hop has so much great information. Really loving this hop. And thanks for the chance to win a great prize. The balloon animals are super fun!! Cute party animal and birthday cards. This is a Mega hop. I love it. Your cards are so cute. What an amazing release. Love both cards! I especially love how you turned the little baby animals into balloons - so cute!! What CUTE balloons! Very clever. Cute and clever! The critters make fun balloons! Wow! Super cute cards! Especially love the shaker card! And that background stamp is so gorgeous! Such a fun idea to turn these little baby animals into balloons! Love it! Love both cards, but especially the shaker. Not only because it's a shaker card, but because of its bright and pretty colors. Also think your making the party babies into balloons was ingenious. I love the balloon animal idea! Perfect! cute cards! love that birthday card! The baby animals as balloons are adorable, and I LOVE the shaker!!! Using the critters as balloons is cute beyond cute.. I think I will have to have this set. What a cute idea to use the Party animals as balloons. Love the card with all the baker' twine. The shaker card is so colorful and bright too. Thanks. Two seriously clever cards! Love the balloons! Love the baby card with the balloons. Those critters really do look like mylar balloons! I like the button border and the alphabet background, too. These two cards are just fantastic. Love the twine with the balloons and I am a fan of shaker cards. Cute idea making the baby animals as balloons. The shaker card is also a great idea. Thank you for sharing. I jut love the baby animals! Great idea making them into fun balloons! Love your cards. Keep it up. Very inspiring. Baby animals are my favorite!! AMAZING! I love the little party animal balloons! Great take on this set!!!! Super fun! I love how you paired up the tiny alphabet background with those adorable animals! And your shaker card is awesome!!! the little alphabet stamp is so useful!! I think that is a MUST HAVE! I really love the idea of the firts card!